Oral health is one of those things that tends to get more and more overlooked as we age. Our teeth, it seems, start to lose their importance once we hit a certain magical number” whether that’s thirty, forty or fifty. Back when we were still young’uns, though, we had to listen to hours on end of explanations and arguments. And boring lectures on how to brush our teeth, how to floss, how to do this and that. And this again to ensure that everything looks perfectly white and porcelain-like. Now, as parents, we must live through that same chore once again, albeit slightly differently. Yes, it’s time to teach your child “as soon as the get their first tooth, optimally” how to take care of their fangs. And what better way to do that than to start with the best, young’ un-friendly toothbrushes out there? 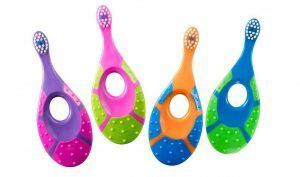 Let’s take a look at all our top picks for Baby Toothbrushes and see which is best. This list is revised frequently to keep audience updated. Last, this page was edited on 9 January, 2019. 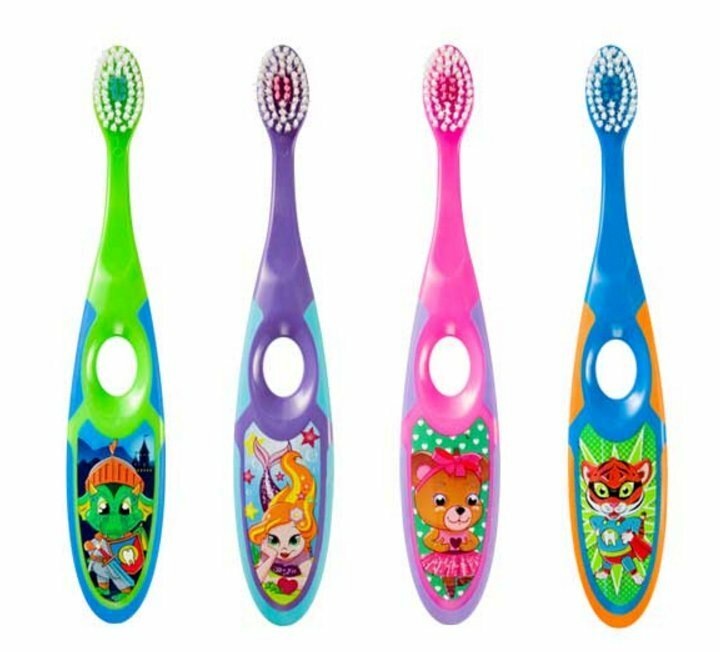 Here are top-rated toothbrushes for your baby. One of the more unique-looking toothbrushes available, this appropriately-sized and well-shaped product was specifically designed for infants. Its styling will surely impress them, not to mention the brushing, which, thanks to a good choice in materials, is easy and without pain or effort. 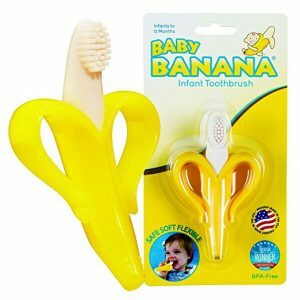 The Banana Toothbrush is designed to be flexible, being able to reach any area of the mouth easily, and the colored base doubles as a teether, making it more practical and safer than a standard toothbrush. Speaking of colors, the Banana Toothbrush is available in three different ones; blue, yellow and pink. Alternative designs, such as a green-and-yellow corn cob variant and a blue-colored shark look are also available. The Banana Toothbrush and its derivatives are made with infants of up to twelve months of age in mind. 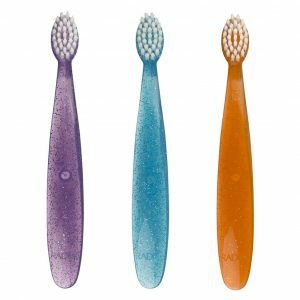 For a more conventional-looking toothbrush, RADIUS offers the Totz, available in countless color combinations. Featuring a very simple design with extra-soft, infant-friendly bristles, the Totz has been a favorite of many parents around the world for quite some time now. It is FDA-approved, if that’s important to you. And is manufactured and marketed mainly in the US. So if you live in Europe or any other region, you might find it difficult to get hold of a Totz and might need to rely on different products instead. The Totz is designed for toddler of at least 18 months of age, but there is also a similar version, called Pure Baby, made for infants between the ages of 3 and 18 months approximately. Unlike some more age-specific models on this list, the Jordan Step 1 Toothbrush is designed to be able to be used comfortably and safely. And also in a manner that promotes oral health by anyone up to the age of two years, which gives it a lot of leeway and a broader demographic. The design is fairly ergonomic. With an unusually large and pronounced grip, small, but extremely soft bristles and some textured plastic, it aids in holding the Step 1 properly. Though mainly designed for toddlers and young children, the Step 1 has also found popularity among seniors. Most Seniors find the shape comfortable to hold and the soft bristles great for cleaning out the crevices in between teeth as well as for soothing the gum without damaging it. It is very important when it happens to be overly sensitive. In any case, the Step 1 can be said to be quite an effective toothbrush, innovative in design and more versatile than most. The Tooth and Gum Cleanser by American firm NUK is a little different from what most would arguably define as a ‘toothbrush’. To begin with, it looks nothing like the traditional brushes we are so used to seeing by now. There is no handle, for starters. As the Cleanser is hollow, you are supposed to wear it by simply putting your finger inside, like a thimble. But the rest of the product isn’t all that traditionally-designed, either. There are three sides to the Tooth and Gum Cleanser, three surfaces for three different purposes. First, there is one side with two lip-like protrusions and an array of bristles in between. This serves the role of a traditional toothbrush. Next, there is one large, smooth and mostly featureless surface, good for simply being chewed on or used as some other sort of toy. Third, there’s a similar, larger surface. But this one is heavily textured and can be used to more comfortably and soothingly clean out parts of the sensitive areas of the gum. For example, putting less pressure on those areas than the bristles. 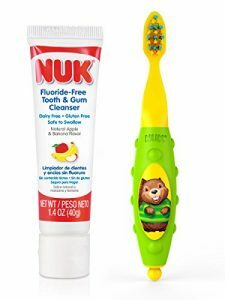 Using the Tooth and Gum Cleanser is a little strange at first, “it is not like you would normally go about brushing teeth” but soon enough, your child should get the hang of it. Still, the Cleanser was made to also fit an average adult finger, so it allows you to do the honors yourself if you wish. What’s more, for added value, it comes with a full tube of some pretty good toothpaste included. Well, the Pro-Health Power Kid’s Electric Toothbrush, apart from being quite a mouthful, is not just great, but stands out from the pack by being, as the name unfortunately gives away immediately, electrically powered. Though electric toothbrushes have become common among us adults, for some reason, the ‘2 years and younger’ sector has really missed out on these up until now. Fortunately, Oral-B is here to save the day. Though marketed mainly for kids of 3 years of age and up, there’s no real reason not to recommend the Oral-B Electric for children and toddlers much younger. It works just fine with even the most sensitive teeth thanks to great bristles and ergonomics. There are multiple designs available to cater to your child’s tastes and the whole package just costs you $5. It is much less than what you would normally expect from a top-tier electric toothbrush by one of the biggest brands in the market. Size – This matters a lot. Preferably smaller sizes are considered to be more accessible while brushing teeth of babies. Shape – Again alongwith size , shape of a toothbrush also matters. Afterall baby is going to learn a process which he will continue doing for his whole life. Therefore shape needs to be handy and comfortable while doing the brusihng process. Material – Babies are more prone to health issues. So while choosing the toothbrush look for build material. Most of the companies are using BPA free materials and food grade silicone bristles. But still assure before purchasing that you have got the right product in your hand. Certification – This one is important as certification assures of the quality and global standards. Checkout the product is certified from an authorize organisation or not. Don’t purchase if it is not certified. Expert Recommendation – Every product in their marketing campaign projects the expert recommendation tags. This is important as expert opinions are obvious helpful in any product category. A highly recommended product is always better. Granted, all of the above baby toothbrushes are wholly different from one another. It will depend on your child, your exact needs and more to find out which is really best for you. We can’t make that decision from where we’re standing, but you can. We wish you great luck in choosing the toothbrush that’s perfect for your offspring!